This notable house is famous for its appearance in the James Bond classic “Diamonds are Forever.” Bond girls Bambi & Thumper rough 007 up a little before he successfully rescues billionaire Willard Wyler from his arch-villian kindnappers. 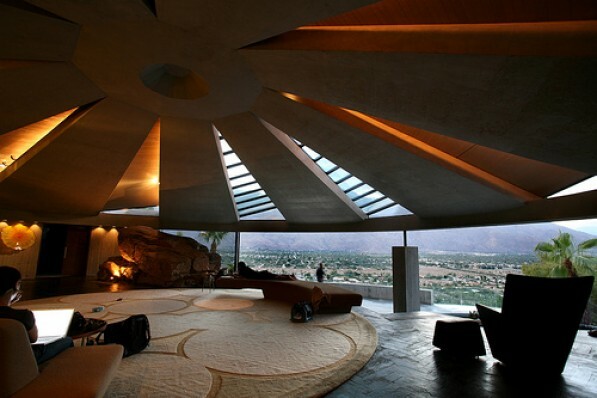 The 8,901 square foot home was designed by John Lautner for interior designer Arthur Elrod, in 1968. The home features a concrete domed ceiling with fan-blade like skylights. The home also blurs the division between inside and out. This entry was posted on Wednesday, November 17th, 2010 at 4:57 pm	and is filed under architecture & design, notable homes. You can follow any responses to this entry through the RSS 2.0 feed.